Miami, Mutton and bluebells: Sentence a Day, April | Is This Mutton? Easter seems such a long time ago! Had a lovely Easter table and roast rib of beef. The kids and their partners came for lunch and we played games afterwards. Public holiday. Went for a 7.5 mile walk in gloomy weather. Very muddy! Worked from home, no walk - although John did go for a walk with his sister who's joining us on the 200 mile Coast to Coast walk in May. Beautiful spring day. Back at work and squeezed in a walk at lunchtime. Worked from home. Did a Power Plate class - very tough, haven't been for more than a week. Overcast. Did a 7.5 mile walk with J and he cleaned my car. Did Power Plate and the usual Sunday roast (chicken). No guests this week. Drizzly. Rejoined a gym where I was a member a couple of years ago - more classes and a swimming pool. Won't take effect for a couple of weeks. Had my hair done (regrowth) ready for business trip to Miami next week. In the office - bought a few groceries at lunchtime on my walk. Dreadful weather - raining and foggy. Fortunately was distracted from the grim weather by a very good podcast, a BBC Radio 4 drama in four parts called The Unforgiven. Did an early morning 8.5 mile walk with J with extra hills (!). All this walking is preparation for our holiday in May. Sunny at last. Did some serious gardening for the first time this year. Sent J up to the attic to get a large suitcase. Cloudy. Did Power Plate, shopping and packing. J went out with the marathon newbies he's been training - their last training session before the big day on April 22. 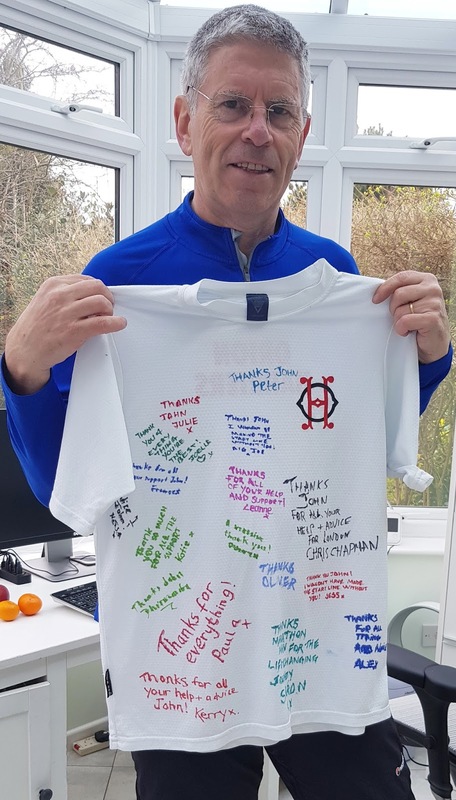 They gave him a signed running shirt to thank him. Early start, up at 5.30am. Drove to Heathrow airport. Flight to Miami was long (over nine hours) but watched four films back-to-back: Three Billboards Outside Ebbing, Missouri (not as good as the hype suggested); Goodbye Christopher Robin (ditto); I, Tonya (very good) and The Battle of the Sexes (passed the time). Went to bed at 10pm local time after a pleasant dinner outside with the team. Our sales conference started with keynotes from 8.30. Agony to see the blue sky outside and not able to enjoy it! Dinner was in the hotel and the after-dinner speaker, a tech comedian called Ed McMillan was very funny. 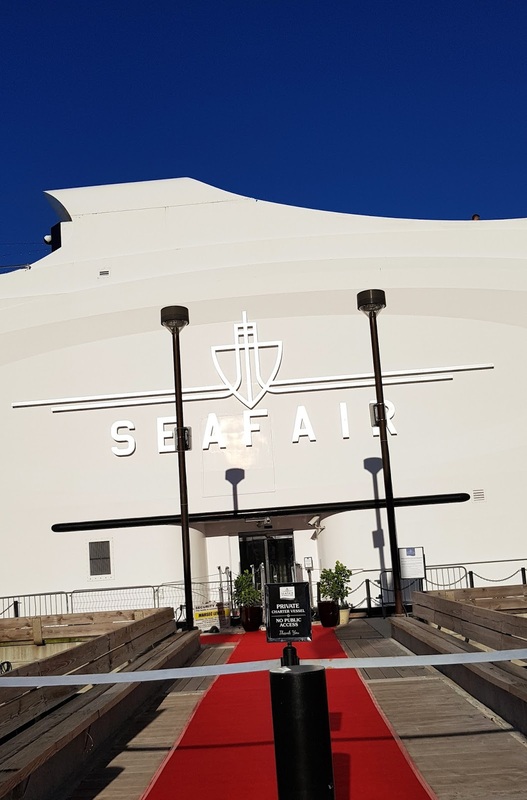 The evening entertainment was a trip on the huge yacht Seafair, just a few metres from the hotel. Unfortunately it didn't set sail - we only moved about 15 metres! Stuck in the mud. 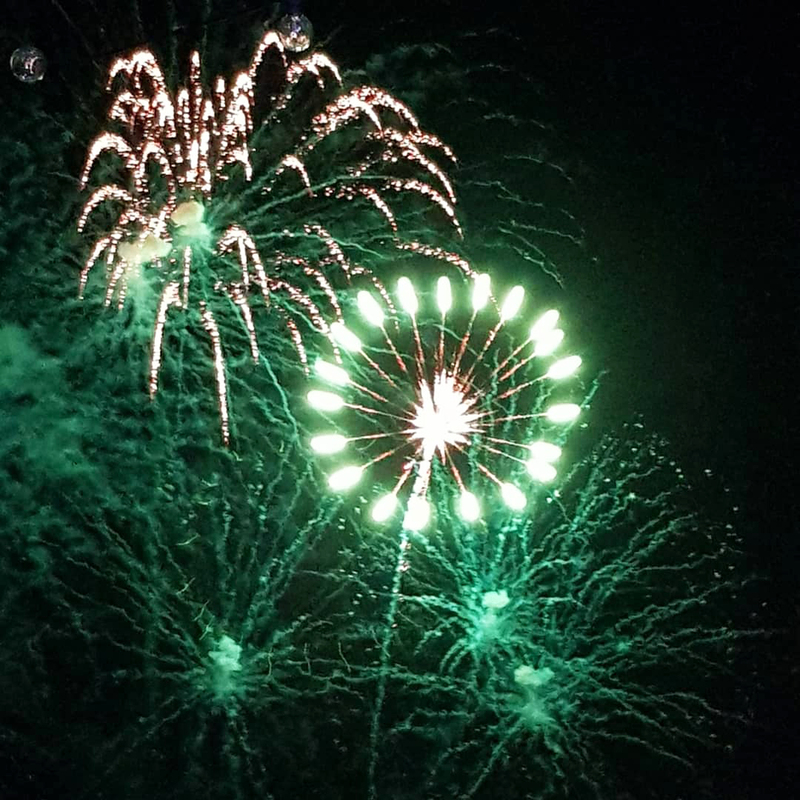 It was very pleasant drinking champagne in the sun, and the evening rounded off with spectacular fireworks. One of the keynote speakers was an Admiral who's a former US Navy SEAL. Very charismatic speaker. Conference ended and the afternoon was spent with the marketing team. We had various breakouts, including a brainstorm out in the sun. Had dinner with a smaller subset of the team at a seafood restaurant and then some Mojitos at the hotel. Long day waiting for a 6.20pm flight. 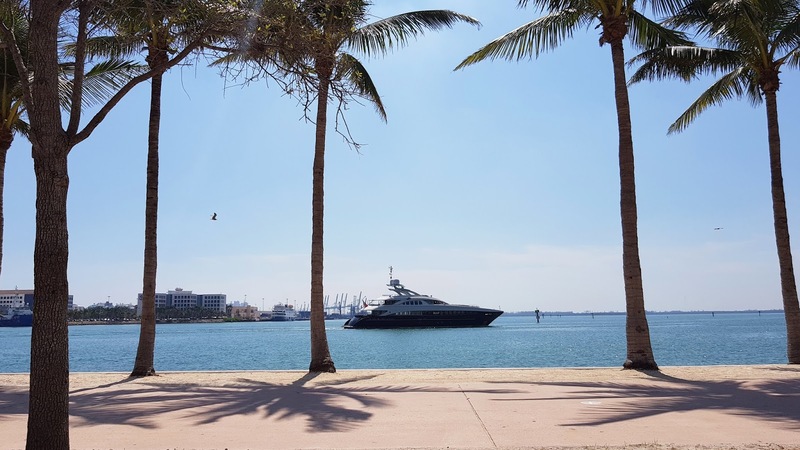 I went for a walk and sat in the sun reading, (this was my view) feeling guilty I hadn't gone out with my colleagues who went to South Beach. But after a full-on week, this friendly introvert needed some time alone. Landed ahead of schedule at 7.30am. Sunny! Home by 10.15. Had two hours sleep and sat in the garden. Great nine hour sleep. First time in about 12 years that J hasn't run in the London Marathon - he was injured this year. Went to Power Plate and did some gardening. J went to see "his" runners in the Marathon and was back by 2.30 for lunch. Early morning short walk, went to a bluebell wood in Epping Forest. It's in a fairly secret place so hasn't been ruined by kids and people walking all over the flowers. Beautiful. See my post here. In office. Rained most of day. 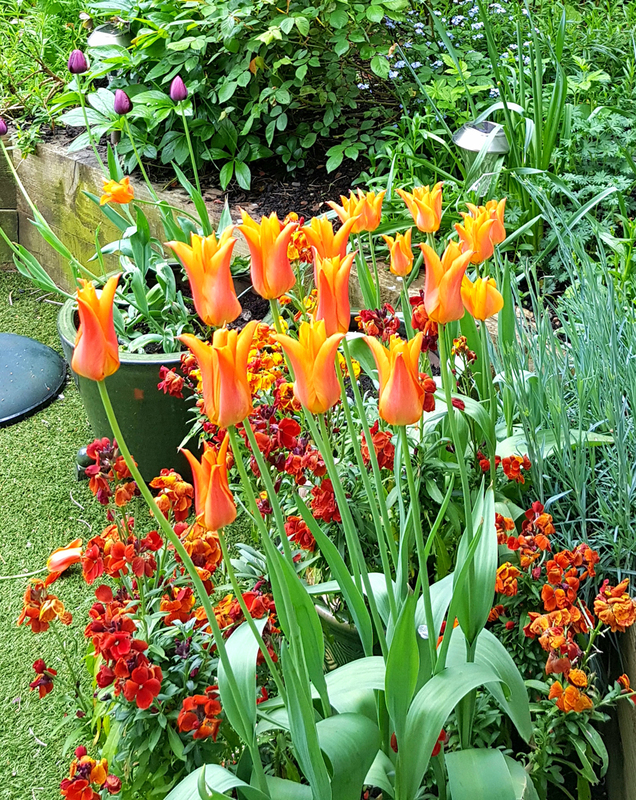 Fortunately the tulips and wallflowers are brightening the garden. I experiment with different colours each year. Orange and purple this year. Had health MOT at gym, last done in 2015. Am in top 10% of age group! Very pleased. Cholesterol needs to come down - too much cheese. Saw ad for a pop festival featuring Mott the Hoople. Thought they were all dead, except for Ian Hunter. Apparently not. Mr Mutton not remotely interested in going. Out with Anna from Mutton Style. "Les Deux Moutons." 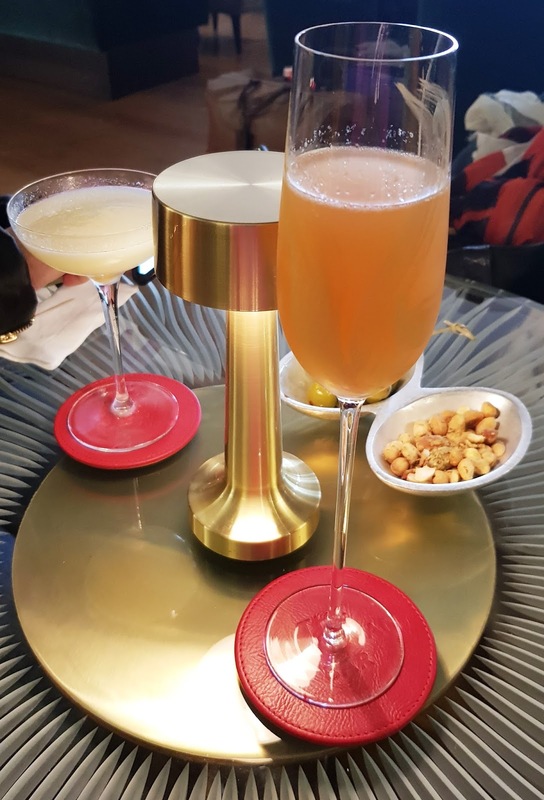 It was raining and we had time to kill before our reservation at Quaglino's, so we found a hotel in the streets of Mayfair. The cheapest cocktail was £18! There was no escape so we had a cocktail each - but avoided the one priced at £5,500. Had such a fun evening. A little jaded this morning after all the wine and cocktails! Managed to go shopping and then packed the new giant rucksack in a a dry run for the hiking adventure. Bitterly cold still. Walked to the gym. Saw a beautiful lilac tree. Even with a slight cold, I could smell the gorgeous fragrance. Been incubating a cold. The weather was atrocious. Worked from home. A triple whammy today of eye test at optician's, followed by a filling, the first for about 15 years, at the dentist, and rounded off with a smear test. Such fun! Mostly rained today. Spring, where have you gone? Went for short walk and alarmingly one of my knees became very painful and clicky. Have taped it and will rest. 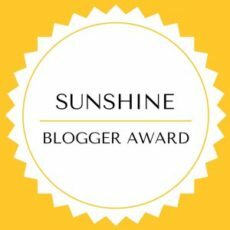 Sharing this post with Weekend Blog Hop at Claire Justine, Saturday Share at Not Dressed as Lamb, Fakeituntilyoumakeit at Fake Fabulous and #BloggerClubUK at My Random Musings. In my May post I'll be covering the 200 mile hiking adventure with photos - do pop by on June 7! Don't miss a post - follow Is This Mutton? on Bloglovin or Feedspot. You'll love "shoe of the day" on Is This Mutton? Facebook page. And check out the Is This Mutton? 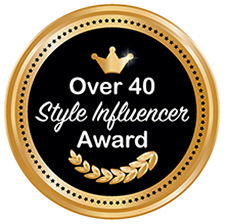 Pinterest boards, including boards on other bloggers in fab outfits plus beauty, jewellery, hairstyles and fashion picks. Is This Mutton? is also on Twitter. Oh wow! I hadn't clocked that you're doing this share. Might try for May as too unprepared for April. Well, you do get about! What an amazing job you have with Miami for a work trip but I totally get the friendly introvert thing as I too just must have time to myself, to write for a start. That first pic of your table is beautiful You have a very good eye for detail and colour and setting - just lovely. Take care of the knee. Oh you must join Penny! I try to write my sentence each day in a Samsung Note on the phone - and have to remember to take photos. Thanks for your kind words about Easter and the knee. Hi - lovely to meet you through the SAD (which I cheated on slightly!) You certainly had an amazing month - and you're another Midlife blogger who puts my fitness levels to shame. I'm off to read a few more of your posts - I'm not a fashionista, but I can appreciate those who love a great outfit! Nice to meet you too Leanne! I love reading about life in Aus! Is that the coast to coast charity run that they always show on the BBC? You have some interesting life! May I ask what your proffesion is? Hi Nancy -it's a 200 mile walk across three national parks in the north of England. Can also be done as a cycle ride. We're not doing it for charity. I'm a marketing manager at a tech company. It's probably good to get all of those appointments done in one day, Gail. Then you can relax and enjoy the rest of the year!!! Oh my dizzy aunt, what a glam life you lead! Loved the shot of J cleaning the car. Glad you and Anna met up, and I'd love to sing along to Roll Away The Stone or All The Young Dudes with you (love 'em), shame about the water separating us 😖. Now don't laugh but I did the sentence challenge in March. It all read so boring, then TP was rushed to hospital and from 18 March onwards the entries switched to medical stuff which I'm guessing is not something most readers would want to read. What a month to choose to write a diary, thought I !! 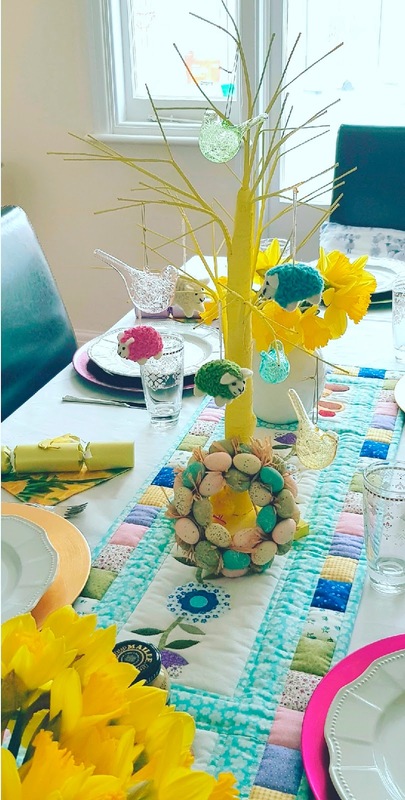 Lovely Easter-themed table, and garden you have, Gail. Bravos for staying fit! I look forward to reading more about your Coast to Coast walk. Have a fabulous May!